image	How does He want me to worship? Jesus declared, “Believe me, woman, a time is coming when you will worship the Father neither on this mountain nor in Jerusalem. You Samaritans worship what you do not know; we worship what we do know, for salvation is from the Jews. Jesus announces that the time had come for the end of worship in the Temple for Jews, or on Mount Gerizim for Samaritans. The pattern is set then, that the “where” ended when Jesus said it ended. We need no temple, because if we worship Him as he asks we ARE a temple. We are a temple. Wow… how does my temple look right about now? The Samaritans had intermarried with the Canaanites, Assyrians and others, and in so doing had syncretized (mixed) their faithful Jewish worship traditions, which is why Jesus tells the woman that her people worshiped what they did not know. The Jews, for their part, worshiped their worship traditions, and grew to leave God out of the whole thing… they had become whitewashed tombs (Matt 23:27). Surprise! The people messed it up, but Jesus gave us direction on how to get it right, very simply. 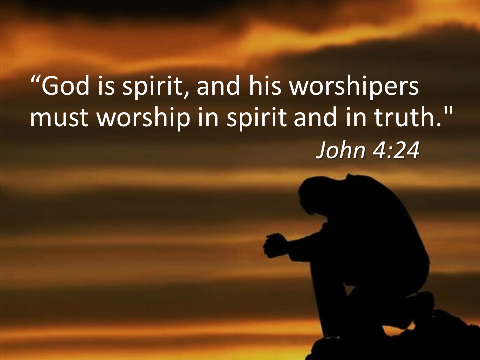 Worship God in Spirit and Truth. God – Father, Son and Holy Spirit. Three persons, one being. John 14:9-10 tells of Jesus talking to Philip who wants to be shown the Father, and Jesus tells him, “Don’t you know me, Philip, even after I have been among you such a long time? Anyone who has seen me has seen the Father. How can you say, ‘Show us the Father’? Don’t you believe that I am in the Father, and that the Father is in me? The words I say to you are not just my own. Rather, it is the Father, living in me, who is doing his work.” When we worship Jesus, we are worshiping the entire Godhead in the way God incarnate told us to worship. We worship in the Spirit just as Jesus describes the father being in Him and He in the Father. The Spirit is in us and we are in the Spirit. At least, when we are saved and regenerate, we are in the Spirit. We’ve made a point, as Christians, to work very hard at getting this last part wrong. When you are saved, you are saved. You may not act like what other people expect a saved person to act like, but unless someone has a special insight that discerns salvation I cannot see how we justify judging fellow confessed believers. The Apostle John expands on this in 1 John 5:12, when we writes “Whoever has the Son has life; whoever does not have the Son of God does not have life.” John doesn’t say, “whoever speaks in tongues”, or “whoever reads only the King James Version”. Any preacher who says you must do a certain work to be saved could use another trip through a better seminary… The Bible. In a previous post I discussed the Bible. It is the true, pure, inerrant, plenary Word of God. It tells us all that God cared to reveal to us about Him, and in a thorough understanding of the Bible we understand what worshiping in truth is, as well as worshiping in spirit. If we don’t cherry-pick our verses (eisegesis), we can know enough to know if the Holy Spirit is guiding our worship, or another spirit might be trying to come between us and God. The truth of Scripture is just as important as the guidance of the Holy Spirit. Spirit and Truth. If the question of how to worship has had you puzzled, I would love to hear your thoughts. Would you take a minute to answer my poll? That’s the end of post # 2. I hope to hear from you, so please share comments here, or visit my website: davidmcdonnough.org and click faithblog. Until I hear from you, be well and be blessed. Could Tyranical Political Correctness Have Possibly Killed Itself? "What would you do if something spiritual disproved your scientific beliefs?" How does He want me to worship?